The day will begin at 10am with the traditional “Blessing of the Animals” by Fr. Tim Backus in the beautiful Gardens of St. Clare directly behind the church. New to the St. Francis Day Celebration this year is our “Arts & Crafts” Bazaar. From 10am until 4pm, artists will be offering their arts and crafts for sale inside the church’s Parish Hall, or, in outdoor booths. The goal of the Bazaar is to provide an affordable opportunity for local artists of all ages to introduce their work to the community. If you are interested in exhibiting or know someone who might be interested, please call Beth Cyr at 850-449-1444. After the Blessing of the Animals is complete, our traditional Fish Fry with cheese grits and sides will begin at approximately 11am. Hamburgers, hot dogs and all the trimmings are also included. The cost is $8 per adult with kids (under 10) eating FREE. So, bring the whole family and enjoy the feast. There will also be a Bake Sale with a wide assortment of delicious baked goods for you to take home. 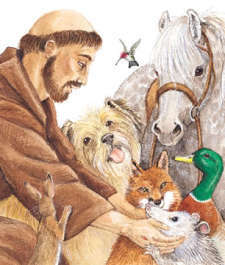 • St. Francis’ Episcopal Church Women have arranged for a veterinarian to be present who will be prepared to administer a rabies inoculation to any dog in need (Cost $10). • Please keep your pet on a leash at all times.